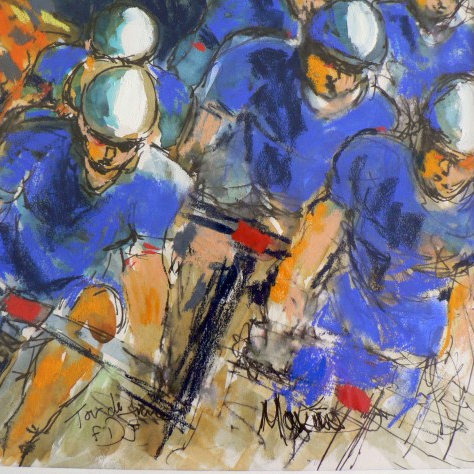 Welcome to my new blog, which follows this year’s Tour de France in quick sketches… very quick! Each day, I make drawings from the broadcast of the Tour in sketchbooks. I use ink pen to make the drawing and add watercolour washes later. I’m making this blog to help me to learn how to blog (currently it’s harder than making the drawings and they’re bad enough – Those cyclists keep moving!) Perhaps I’ll crack it by 22nd July! Two or three years ago I did something similar to this, resulting in a series of thumbnail sketches in my sketchbook. I found myself drawn to the very strong design features within the bounds of the TV screen, the roads and fields dividing the area into some interesting shapes. I had intended to upload them but in the end I never got round to it. I enjoyed the exercise but it took so much time I am not sure I would want to repeat it in the same way. The tour is certainly compulsive viewing, whether watching the cycling, enjoying the scenery or drawing and something I look forward to. I shall look forward to seeing your work during the rest of the tour. Thanks so much for visiting my site and your considered and insightful comment. It’s very interesting to hear your experience and I completely agree with you about the angles and views that the TV picture gives, things you wouldn’t see necessarily see from being a spectator. I believe that Degas was very influenced by the ‘cropping’ that photographs made and used it in his paintings. It’s a similar idea I think. You are right though, about how time-consuming the process is and I didn’t expect that at all. I’ve felt like a nervous wreck at times trying to keep up. Still, what keeps me going are the very things that the cyclists must have in abundance – the desire to finish and not give up. I really want to get my drawings done every day and to keep going until they ride up the Champs-Élysées next week. Fingers crossed, hopeeternal!